During my training as a medical student, I noticed a reoccuring theme, that most patients were suffering from one of the 5 main chronic diseases that are responsible for 50% of all Australian deaths per year. I asked myself, whether something can be done to prevent this. 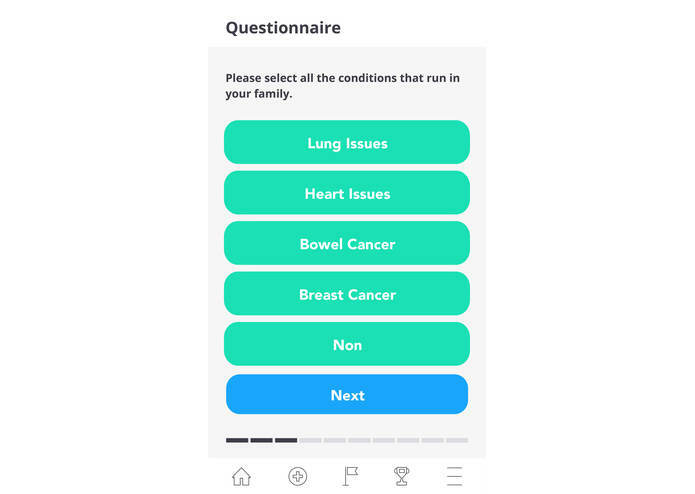 The app assesses your health status with a basic questionnaire, which results in our unique health score. It then suggests daily habits for you to take up. As you log these activities each day, you collect "health points", which allows you to unlock real life rewards, like discounts to your favorite stores/services. We wireframed the design with paper and had our talented designer to bring it to life with Indesign. The health questionnaire algorithm was built with java with a basic website front end to demonstrate the function. It was difficult to make a functional prototype given the time and resources we had, so we stuck with just mock ups. Seeing our idea come to life. Time management is extremely important with these type of events. Map out your timeline.